Please note that Armand will not divulge your contact details to any other 3rd party. I'd like an estimate for a new paving job. How do I go about this? The first thing to do is get in touch with us! We’ll arrange everything for you after that. Simply contact us and we'll have an initial chat and then, if you're happy, arrange to come and see you. No. 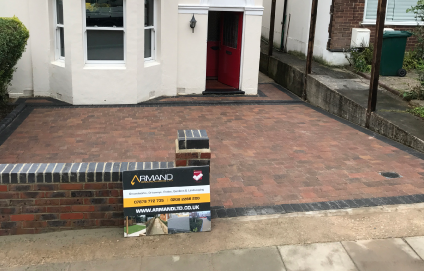 We only create top quality driveways that are built to last - so your new driveway will only be installed after a sub-base has been laid down. Our sub-bases are made from environmentally-friendly grade 1 MOT roadstone. Your current driveway will be excavated and we'll install a brand new sub-base for you as part of the job. We work very efficiently! On average, our professional team can complete a 100 metre driveway within 4 working days. This is of course dependent on a variety of factors; from the complexity of the design to weather conditions. Rest assured we'll give you a realistic timescale for your job and keep you informed at every stage. What utilities will you need to use during the work? We are very self-contained and will only need the use of water and ocassional electricity whilst on site. Only our fully trained and experienced pavers will carry out your installation. We never sub-contract any of our work to anyone else - that's a guarantee.